Sgt. Jesse Lhotka of Appleton and two other Minnesota National Guard soldiers were killed last week in Iraq by a roadside bomb. Lhotka is the most recent in a long line of Appleton residents to die in battle. Reminders of the town's service are everywhere. Appleton, Minn. — A banner strung across Main Street says "We love you Jesse". Yellow memorial ribbons on light poles and trees flutter in a cool north wind. On the south side of town a flag flies at half staff, the ropes whipping furiously against the metal pole. Just in front of the pole stands a brick memorial called "Flags of Honor," built in memory of area soldiers who fought in war. It lists more than 200 names. A few blocks away a World War II tank with "Minnesota National Guard" printed on its sides stands sentinel near the armory. Flanking the Pomme de Terre River is Veteran's War Memorial Park, with granite slabs and flags honoring all military branches. As a light snow fell, hundreds gathered at the park Sunday evening to remember Sgt. Lhotka. Kelly Wasberg, 151st Field Artillery chaplain, led the crowd in prayer. "God, we ask your presence this evening as we gather, as we mark the lives of Jesse and David and Jason," he said. After the vigil the crowd filed out onto Miles Street. It's named for Private Hugh Miles, an Appleton resident killed in World War II, September 1944 in France. His funeral was held eight months later at Zion Lutheran Church, the same church now being prepared for Jesse Lhotka's service. 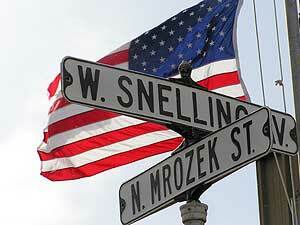 Most of the streets in Appleton are named for soldiers who died in war. It's a source of comfort for Don Schlieman. He's lived in Appleton all his life, and knew many of the World War II veterans named on the street signs. "This is Rooney Avenue. Bob Rooney was the soldier killed over in Africa. He belonged to the old Company M that I belonged to at one time," says Schlieman. He delivers a running commentary on a drive through town. He joined the National Guard in 1938 and served in France in World War II. He points to a street sign that has his last name on it. "To my left, right there, is East Schlieman Avenue, that man was an uncle of mine who was killed in the Battle of the Bulge," says Schlieman. The gusty wind whips up fluffy snow that's still falling in occasional flurries. Look far enough down the road and the end of the street disappears in a soft white cloud. The eye can't see what lies beyond, but the mind can. The imagination wants to follow the street past houses, schools and churches, through the snowy cloud into history. The Battle of the Bulge, the invasion of North Africa, Okinawa, D-Day. All of those famous battles are linked forever to the streets of Appleton. "This is Thielke Avenue, this is the boy that was killed, a first cousin of mine, killed over in Africa," says Schlieman. Of all the names, he was closest to his cousin. He remembers skating with him on a homemade ice rink the Thielke's built. Most of the names on the signs are from World War II, but a few are more recent. Gunderson Avenue is named for Thomas Gunderson, Appleton High School class of 1967, killed in Viet Nam 1970. Schlieman says the signs unite the town, fostering a common history for young and old. For him, memories of combat are always close by. "You don't know what's going to happen, you're walking on air. Lead a patrol at nighttime, you haven't any idea what you're going to run into," says Schlieman. He says he follows news of the Iraq war very closely. He's all soldier, he even gets an Army newspaper to keep up to date. But he says in times of war his own combat memories are stirred up. "I've gotten old enough now where I do quite a bit of dreaming about the Army. And that's not good. My local doctor has kind of given me some medicine that I can take, a pill, to keep me settled down," says Schlieman. "I just feel bad enough that we lose all these people that you know. And war is not good." Schlieman takes a hard line on the Iraq War. He says it's better fighting there than here, and says the U.S. must see it through. Parked in his driveway, he says he's sure the city will hold another street naming ceremony soon, in honor of Sergeant Jesse Lhotka. When that happens, the newly named road will take travelers on a long journey. Past houses, maybe a church or business, to a dusty road in Baghad on a February morning, where some Minnesota National Guard soldiers are approaching an overturned vehicle. Soldier photos used in this story are from the booklet "Appleton, Minnesota: Home of Honored Veterans" printed by Johnson Publishing Company of Appleton. Why are the Red Bulls already going overseas again?